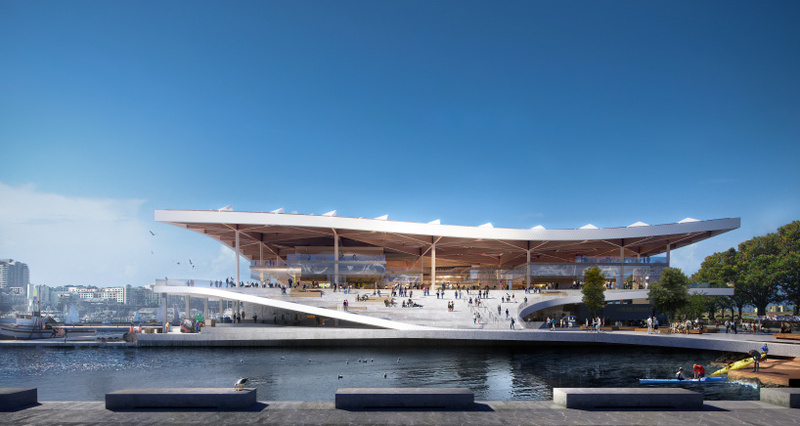 3XN has released plans for the new sydney fish market — a project the firm was commissioned to build in 2017.
the building, which has been designed as a landmark structure for the australian city, will operate as a working market while simultaneously establishing a public connection to the water’s edge at blackwattle bay, an area set to undergo ambitious renovation plans. 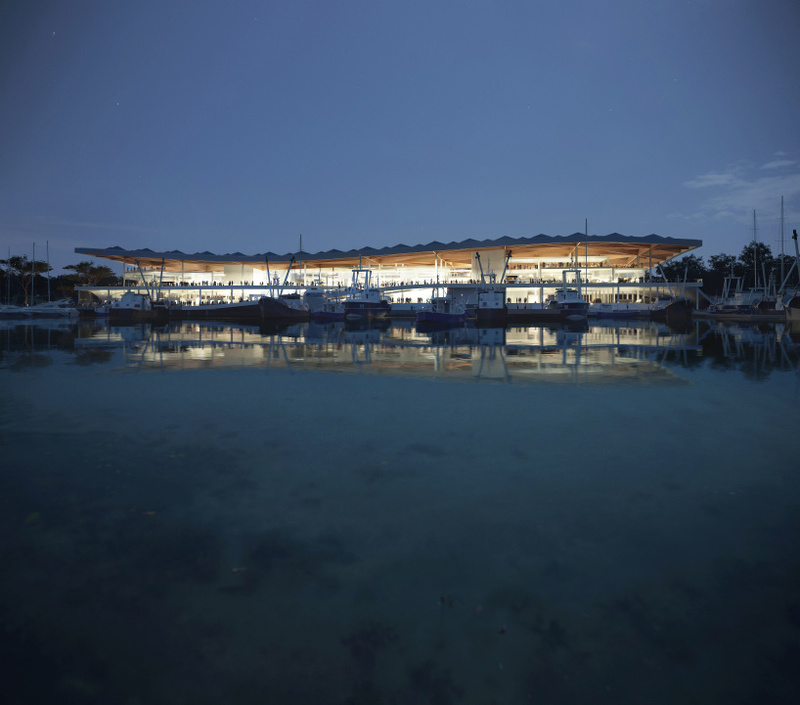 3XN — who worked on the project alongside local architect BVN, GXN innovation, and landscape architect aspect studios — approached the brief with the goal of creating more than just a fish market. 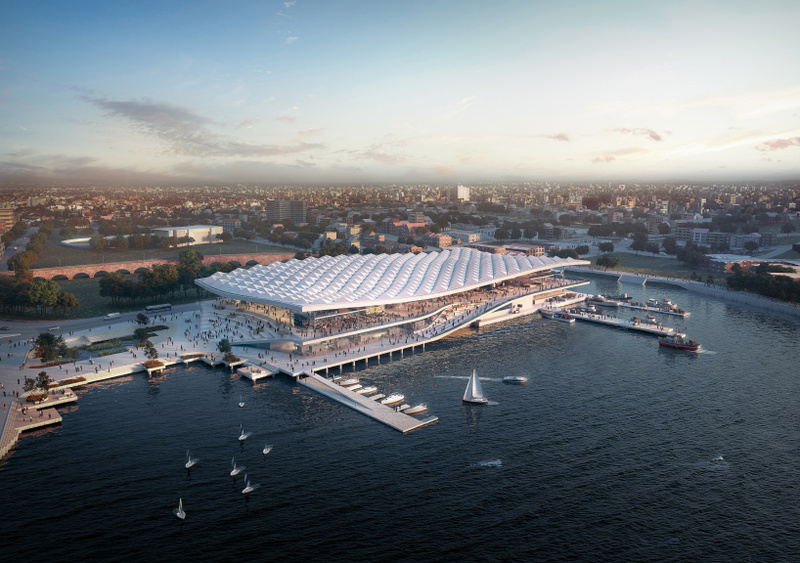 ‘this building will be many things when it is done: a working fish market, an amenity for the city, a cultural destination, an urban connector, and an inspiring icon along the world-renowned sydney harbour,’ explains kim herforth nielsen, founding partner of 3XN. 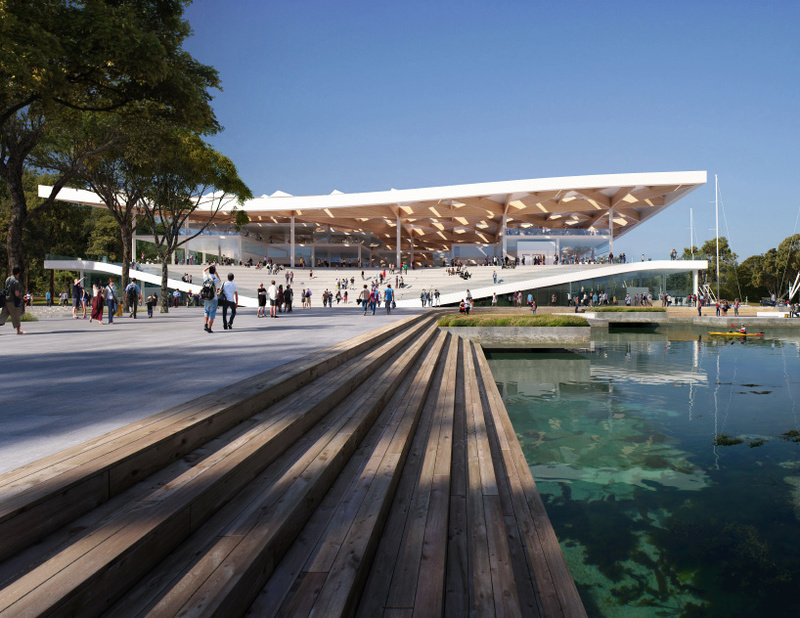 the project will relocate the existing fish market to a 3.6-hectare site at the head of blackwattle bay. the design capitalizes on the opportunity to link the bay with the significant green space of wentworth park to the south, as well as the broader cityscape. 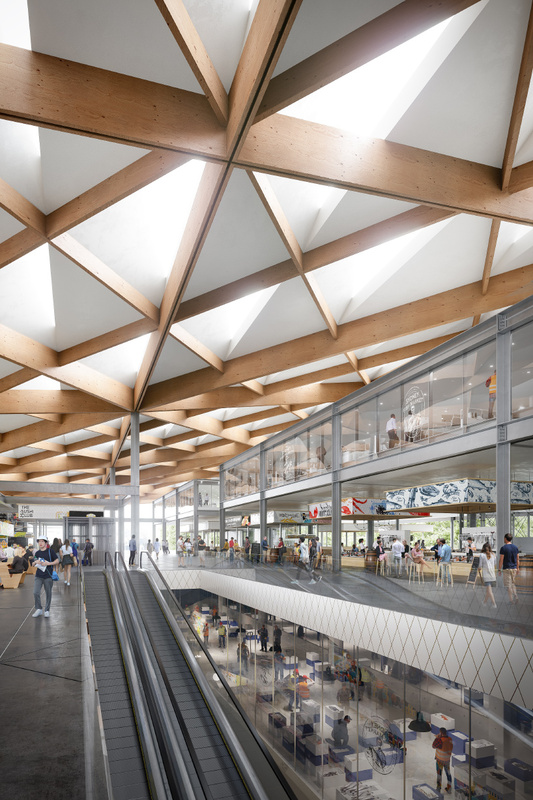 inspired by the traditional market typology, the scheme preserves the intimacy and flexibility of open-air stalls united under a single sweeping canopy. 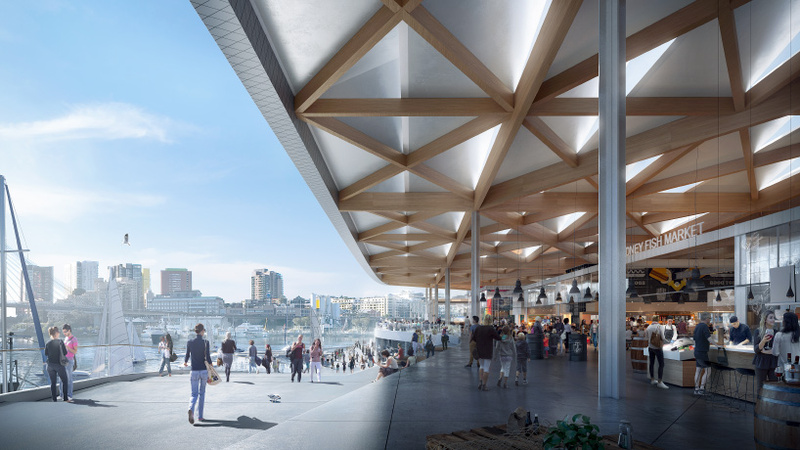 throughout the design, the architects have sought to maintain a visual connection between the public areas and wholesale or wharf operations. 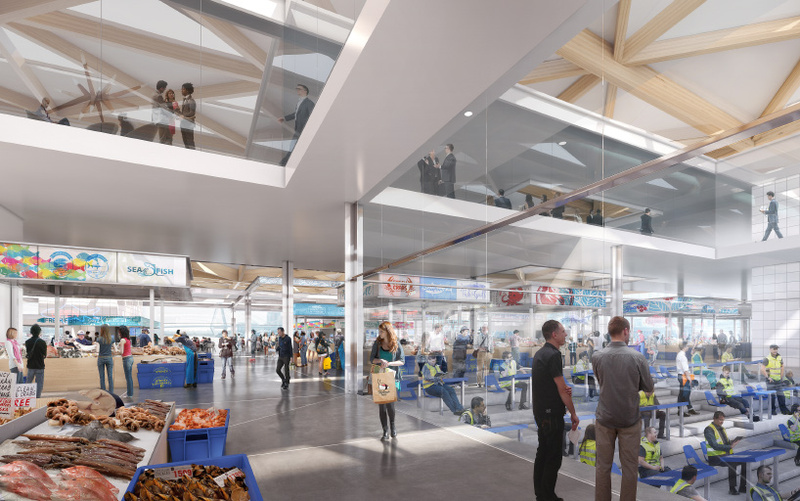 the ground floor hosts functions traditionally associated with fish markets: the landing and loading of fish, the wholesale market, and the auction hall. meanwhile, amphitheater staircases and the foreshore promenade wrap over the operational wharf, allowing visitors to safely see what is going on inside. the amphitheater staircases that lead from the plazas to the public market are a continuation of the surrounding landscape, establishing a foreshore promenade around the bay and opening a new public route along the water’s edge. plazas at each end of the fish market not only allow for informal gatherings, but also house wetland flora to filter both storm- and grey-water from the building. the timber and aluminum roof is another key component of the project. it harvests rainwater for reuse, protects the retail spaces from the sun, and filters daylight for operations below. meanwhile, its distinctive shape is not only a result of the program below, but it also uses prevailing winds to extract hot air and protects the sellers from southerly winds. the new building will break ground in mid-2019 and, subject to all necessary approvals, is expected to open in 2023.